David Bowie’s London birthplace may soon be home to a new piece of public art commemorating the late singer, NME reports. Fans have launched a crowdfunding campaign to raise money for a giant lightning bolt statue, resembling the one painted across Bowie’s face on the cover of his 1973 album, Aladdin Sane. Before he became a global superstar, Bowie grew up in Brixton, in south London. Today, there’s no shortage of local tributes to the glam rocker: Pop culture pilgrims flock to Brixton to see the three-story yellow Victorian where Bowie spent his childhood, and to view a nearby mural of the rocker, completed by Australian artist James Cochran in 2013. If it's built, the lightning bolt statue will likely become one of the neighborhood’s most visible Bowie-themed attractions: Mock-ups of the artwork depict a nearly 30-foot tall, bright red lightning bolt, embedded in the pavement. 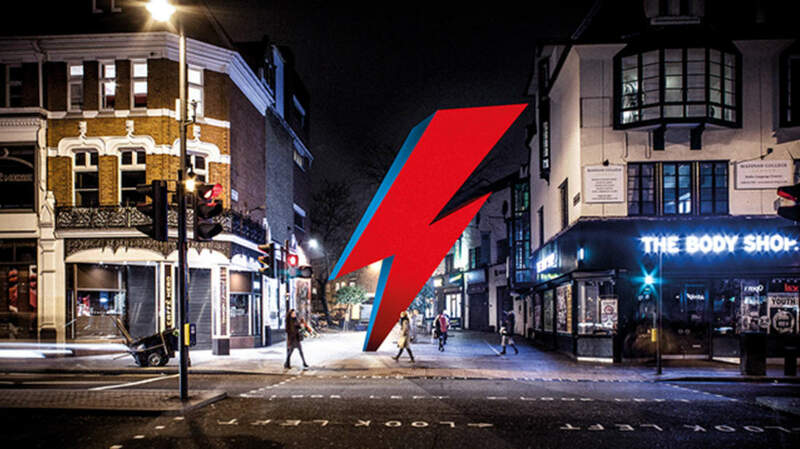 (The Crowdfunder project poetically describes it as “a nine-metre missive from another dimension, hurled from afar.”) The statue would stand five streets away from Bowie’s birthplace, right next to Cochran’s mural. This Ain't Rock'n'Roll, a U.K.-based artist collective, collaborated with members of Bowie’s team to design the statue. According to The Independent, the project already has the local government’s seal of approval; now, all it needs is money. Organizers hope to to raise more than $1.2 million by March 21, 2017. You can donate to the project online, or learn more about it by watching the video below.